Gearmos are robots that appear in Super Mario Galaxy and Super Mario Galaxy 2. 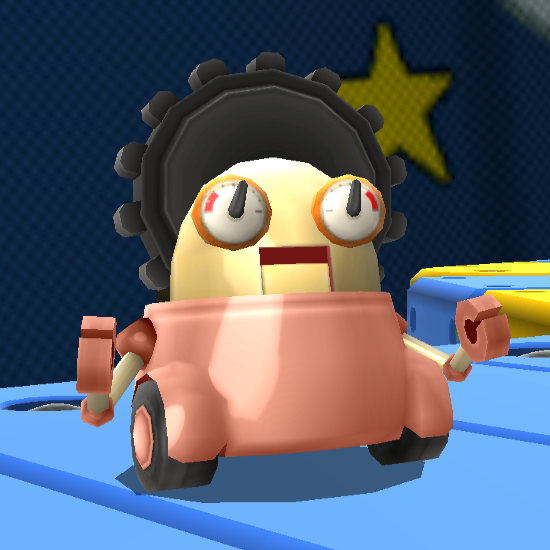 They are usually seen in industrialized galaxies, and are pictured as maintenance robots that often advise Mario. Their name is derived from the Spanish name Guillermo (pronounced "gee-AIR-mo"), and the word "gear". Gearmos make their first appearance in Super Mario Galaxy. Two similar-looking green Gearmos appear in the ammo depots in the Battlerock Galaxy and in the Dreadnought Galaxy. They find it distasteful that trash is being thrown on their planet, and they ask Mario if he wants to dispose of it by blowing it up. If Mario manages to destroy all the garbage within the time limit given, they will reward him with a Power Star. Gearmos also appear in the Toy Time Galaxy, where many of them live. In the level Heavy Metal Mecha-Bowser, many of them are trapped inside Mecha-Bowser's head and are freed after Mario destroys the robot by ground pounding the stack of Stone Wheels on the robot's head. In the Buoy Base Galaxy, Gearmos take care of the Buoy Base, for it is not currently in use, and in the Grand Finale Galaxy, Gearmos monitor the guests at the Star Festival and preventing littering. 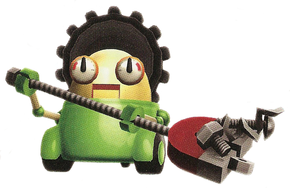 A green Gearmo also appears in the Engine Room of the Comet Observatory, being the only non-playable character other than Polari in a dome. Gearmos also appear in the sequel, Super Mario Galaxy 2. Two Gearmos host similar minigames to the Bob-omb Blasting minigame in the Rightside Down Galaxy and the Upside Dizzy Galaxy. This time around, they give Mario a Fire Flower, and ask him to burn up all the crates in twenty seconds or less. If Mario succeeds, he will be given a Power Star. Later in the game, two Gearmos appear in the Tall Trunk Galaxy's Prankster Comet mission. One at the top of the slide claims to have lost 140 Purple Coins and asks Mario to get them for him. If Mario manages to get 100 of the 140 Purple coins, the Gearmo at the bottom of the slide will give Mario a Power Star. A green Gearmo also appears in Rolling Coaster Galaxy's Prankster Comet, giving Mario the star if he succeeds in getting 100 of the 110 Purple Coins. 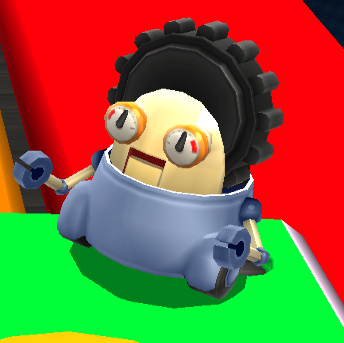 They also appear in the Chompworks Galaxy. Here, they are responsible for breaking open Chomps. When special missions are completed in the Boulder Bowl Galaxy and Space Storm Galaxy, two Gearmos, a Gold Gearmo and a Silver Gearmo, respectively, will join Mario in his adventures on Starship Mario, and give him a 1-Up Mushroom when talked to. In this game, when hit with Star Bits or spun at, their heads will spin around. Some Gearmos can be perceived as irritable, as well as obsessed with tidiness. For instance, the Bob-omb Blasting Gearmos become furious if Mario or Luigi does not complete the minigame. Another one gets angry at him for destroying a giant weight holding down a tower, and another warns Mario to not to let him catch him littering. The Gearmos' torso can come in a variety of different colors including green, blue, yellow, and pink. They also have a large gear inside the back of their heads. If Mario jumps on the gear, it pops out and falls back into place. Gearmos are capable of moving without the gear, suggesting that the gear has no real purpose. If the player gets zero purple coins in the Battlerock Galaxy, the Gearmo at the end will refer to itself as "this old iron lady", indicating Gearmos have separate genders, despite being robots. In the Japanese version, Gearmos speak in Kansai-ben, a non-standard dialect commonly used in Japanese media to indicate that a speaker is humorous or witty. In the Korean version, they talk in a Southeastern dialect. In the French version, they speak with a stereotypical Quebecois accent. In the Spanish version, they speak with a stereotypical Andalusian accent. Gold Gearmo with its new Goomba. Silver Gearmo with its new Topman. Pamatarian Pun on perm and Japanese comic obatarian. Spanish (NOE) Mecachacha From mecánico ("mechanic") and chacha (a vulgar term for "maid"). French Robby From robot and mamie (granny). Pamamma From perm and mama. This page was last edited on February 15, 2019, at 18:37.